Imagine the meteoric force of exhaust gases expelled by four Ariane 6 strap-on boosters and a Vulcain motor ignited at lift-off. A 600-tonne steel deflector, with tiles weighing a tonne each, will take the full blast and funnel these plumes into exhaust tunnels. The triangle-shaped deflector will be installed 25 m below the launch table. It is 8.5 m high, 19.7 m long, 16 m wide, and protects the concrete structure of the exhaust tunnel as well as equipment stored nearby. 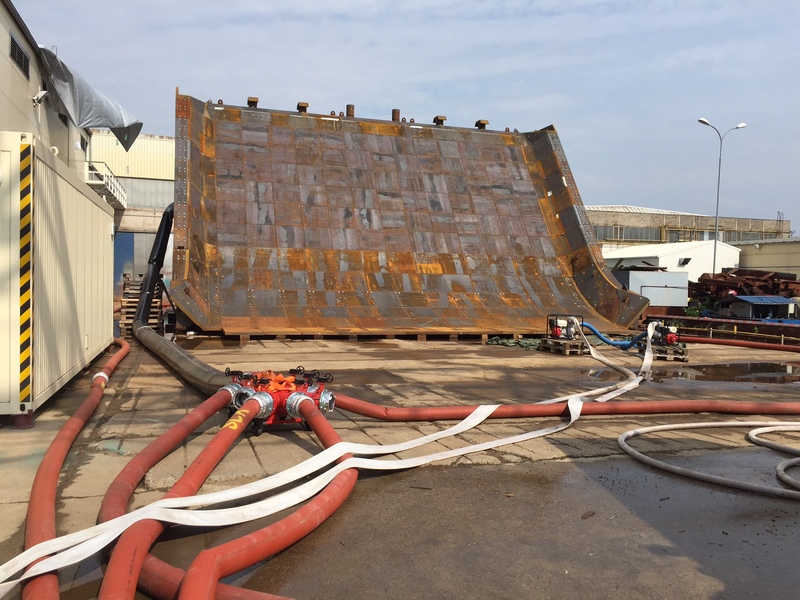 The deflector is currently at MCE Slany in the Czech Republic for tests that include removing a steel tile and testing the deflector’s water cooling system. After tests, it will be dismantled, painted, then packed into 50 containers and shipped to French Guiana over June and August, ready for installation at the end of September. Ariane 6’s maiden flight is set for mid-2020. This new launch vehicle will be gradually phased in to succeed Ariane 5.